A couple weeks ago, I was invited to preview the reimagined menu at The Grill at the Ritz-Carlton in St. Louis. The Grill chef, Damien Faure (who, incidentally, is married to Simone Faure of La Patisserie Chouquette) has designed a menu highlighted by "traditional as well as communal and shared plates [...] along with classic house-made desserts, signature beverage creations, and an innovative Infused Oil offering." Guests can personalize their menu selections with a variety of house-infused oils. Flavors include lemon verbena & avocado, black garlic & herb, bacon & porcini mushroom, purple basil & brandywine tomato, black truffle, and spring onion & chipotle. Everything that I sampled was delicious. I tried the New Orleans-style BBQ shrimp & grits with grilled chorizo; Prince Edwards Island Mussels with lemongrass & Kaffir lime; grilled Medjool dates with bacon, Cambozola, & roasted hazelnuts; blackened steak & mushroom flatbread; Tuscan kale & hearts of palm salad with strawberries & goat cheese (one of my favorite dishes that night); hot smoked salmon with tomato coulis; center-cut filet; beer-can chicken (that's right...Chef Faure wanted to represent a "local" dish); grilled asparagus, roasted cauliflower, & twice-baked potato. Dessert was strawberry & white chocolate baked Alaska and profiteroles with hazelnut ice cream. Yep. It was A LOT of food. I was a happy, happy girl. Before dinner, we sampled a few of The Ritz signature cocktails. Why am I not having cocktails at The Ritz Lobby Lounge on a regular basis? They have like a gillion kind of martinis. 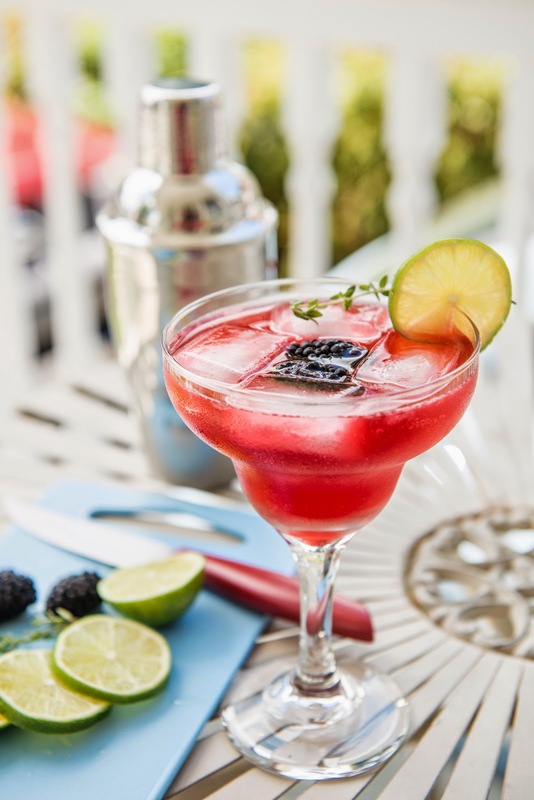 My favorite was the Blackberry Thyme Margarita: "Sauza Blue, Cointreau, Fresh Lime Juice, Muddled Thyme, House Made Blackberry Simple Syrup, Blackberries." To make the simple syrup: combine 1 cup of sugar, 1 cup of water, 1 cup of blackberries, and one fresh thyme sprig in a medium saucepan. Bring to a boil over medium heat. Let simmer until the sugar has dissolved and the berries softened. Remove from heat. Let the mixture sit until cooled. Strain the syrup into a jar, pressing as much juice as you can out of the blackberries. To make a margarita: Shake the tequila, Cointreau, syrup, and lime juice with ice in a cocktail shaker. Fill a glass with ice and strain the drink into it. 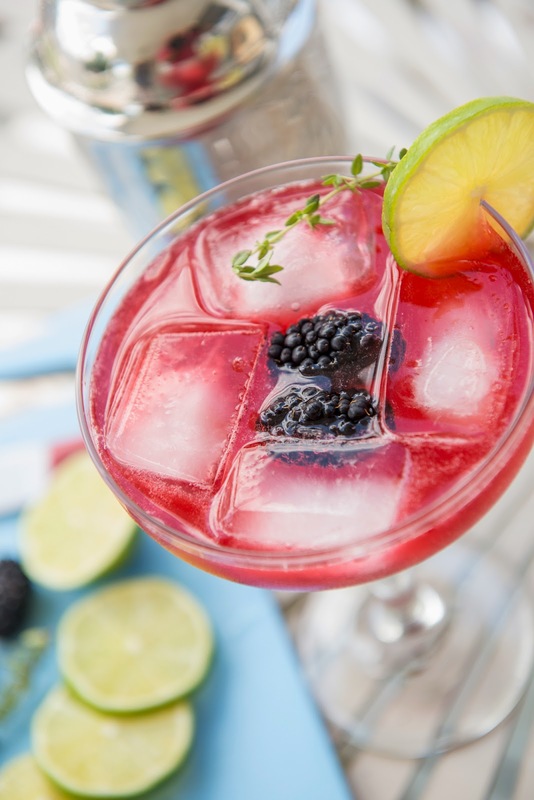 Garnish with blackberries and lime wedge. Thanks to The Ritz Carlton for a fabulous dinner and superb hospitality.